Politician, oil man. Republican. Born: September 9, 1887, West Middlesex, Pennsylvania. Married: Margaret Fleming, 1915 (died 1918). Married: Theo Cobb, 1930. Died: October 12, 1987, Topeka, Kansas. Served as 26th Governor of Kansas: January 9, 1933, to January 11, 1937. Alfred Mossman Landon was born September 9, 1887, in West Middlesex, Pennsylvania to John Manuel and Anne (Mossman) Landon. The elder Landon was an oilman and moved the family to Marietta, Ohio, where Alfred Landon attended preparatory school. When he was 17 Landon moved with the family to Independence, Kansas. He graduated from the University of Kansas in 1908 with a law degree. Landon married Margaret Fleming on January 9, 1915. They had one child, Margaret. 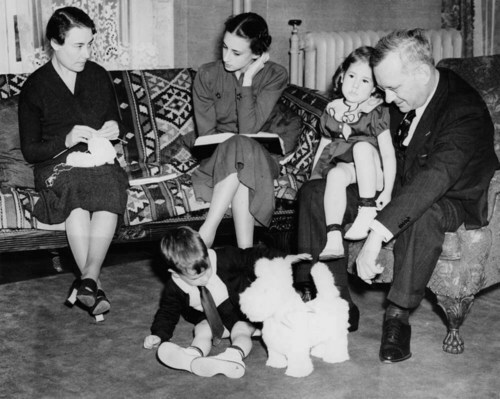 After her death in 1918, Landon devoted himself to managing his oil interests and raising his young daughter. A supporter of Theodore Roosevelt, Landon’s help with the Bull Moose campaign earned him the respect of the progressive arm of the Republican Party. After a short stint as Governor Henry Allen's secretary in 1922, Landon became a leader in the state's progressive faction and in 1928 won election to the state Republican chairmanship. Landon married Theo Cobb on January 15, 1930. They had two children, Nancy and John. He ran a successful campaign for the governorship in 1932. During the time of the Great Depression, Landon was one of two Republican governors west of the Mississippi to win a gubernatorial contest. He introduced programs to bring economic relief that included tax reductions, a moratorium on mortgage foreclosures, state supported local relief, and a series of emergency banking laws; all without increasing the state debt. The national Republicans looked to Landon to challenge President Franklin D. Roosevelt. He was selected as the party’s nominee for the 1936 presidential election. Roosevelt proved invincible in 1936, and Landon was defeated. Landon continued to be an adviser for the Republican Party. He was the Native Sons and Daughters of Kansas' Distinguished Kansan of the Year in 1969. He was inducted into the Kansas Association of Broadcasters Hall of Fame in 1974. He marked his 100th birthday with a visit from President Ronald Reagan. Landon died October 12, 1987. His daughter Nancy was elected to the U. S. Senate in 1978 and served until 1996. The Landon State Office Building is named in his honor.